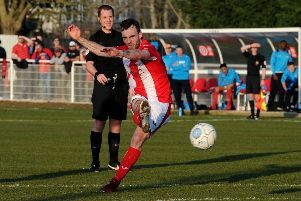 Ardley United avenged last season’s defeat by Ascot United in the Bluefin Sports Challenge Cup Final to lift the trophy with a 2-0 victory in Monday’s final at Didcot Town’s Loop Meadow Stadium. Given their respective final positions in the UHLSport Hellenic League, Ascot were favourites especially with Ardley only having two substitutes, something that has dogged their season. But from the first minute Ardley dominated the final and Ascot were not allowed to impose themselves at any stage. Ardley took the lead when Kieran Scott exchanged passes with Luke Ingram, wrong-footed a defender and then launched a shot which took a slight deflection off a defender’s heel and flew past Chris Grace. The game was a midfield battle with Ardley having the better of it and posing the greater threat as Jon Gardner fired wide and Ingram just put the ball over the far angle of post and bar with Grace well beaten. Ascot’s first chance came just before the break when Damien Markman broke free on the left and launched a fierce shot which Jack Harding was equal to. Having seen their side lead at halftime by the same score last year, Ardley supporters were only too aware they had crumbled in the second half of that final but there was to be no repeat on Monday. Ascot’s main threat was from the pace of their wide players especially through Daryl McLean. But Ardley survived and doubled their advantage when Gardner won possession in midfield and played a perfectly weighted pass through to Ingram who outpaced the defence before firing across Grace and into the net via the far post. Ascot’s introduction of substitutes did little to change the game in their favour and Ardley held on comfortably to pick up the trophy which offsets what has been a frustrating premier division campaign.